The food I can buy at my local supermarket has been getting better and better over the last few years. Locally-grown crops are noted as such, ingredients once considered “gourmet” are widely available, organics abound – I can even get organic milk at the White Hen Pantry, which blows my mind, frankly. I’m glad things are improving, but I think it’s important to remember that a lot of large corporations jumping on the organic bandwagon may be officially meeting federal organic requirements, while still raising food in a way that has nothing to do with the organic spirit. For example, a recent article in Salon reviewed the practices of Horizon Organic, which sells milk from cows which are grain-fed and confined most of their lives, allowed out to pasture only four-five hours a day, three months a year. So, while, yes, it’s great that I can get milk that’s hormone and antibiotic-free at any grocery store, I am still glad to get myself to farmers’ markets, where I can buy food that is truly sustainably raised. I want real organic food because it’s better for the environment and the animals, because it’s more nutritious (I’ll write later about grass-feeding), and because it tastes better. 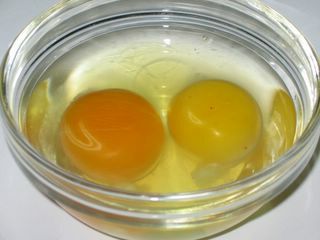 The egg on the left is an organic egg from a local farmer that I bought at the Central Square farmers' market yesterday. The egg on the right is a Wild Harvest, Omega-3, naturally raised (no antibiotics, no hormones, no animal feed) egg. Notice a difference? The difference in taste is as great as the difference in color. I probably should have included a regular, anemic, color-of-chicken-despair supermarket egg as well, but I didn't have the heart to buy any after tasting the farmers' market eggs. Well, they were there, those intrepid farmers! There were just a few booths, as is usual this early in the season. Mostly, they were selling plants, but you could get rhubarb, lettuce, and asparagus, as well as eggs, pies, bread, cookies, and maple sugar candies. I bought beautiful eggs from a farm in Belchertown and a bunch of asparagus from Boisvert Farm in Hadley. For dinner last night, I steamed the asparagus, scrambled the eggs and ate them together, with just a little butter, salt and pepper. The eggs were very flavorful, with deep orange yolks that made scrambled eggs the color of a Buddhist monk’s robe. The asparagus proved that it ain’t about the size – these were thick spears, not the baby-thin straws that people ooh and ahh over, but they were much more tender than most of the thinner asparagus I had last year. So, all in all, a good start to the season, despite the rain. I keep walking out of my windowless office and into the hallway to study the sky, which is grey and spitting rain, as it has been for at least forty days and forty nights. I’m wondering if the farmers will brave the elements and set up at the Central Square market today. I mean, it isn’t really raining-raining, it’s just overcast and a little drizzly. Farmers are tough, right? They’ll be there. I think I’m engaging in some serious wishful thinking. Fortunately, I am not despairing as one might expect, given the weather, because today I got a call from the pig-guy. The pig-guy is the farmer who will shortly be selling my friends and me a whole, organic, traditionally-raised Tamworth pig, all slaughtered and frozen in nice, barbecue-ready pieces. This is our third foray into buying meat directly from the farmer. I’m just finishing up the last of the quarter cow we bought in January, and I have a good bit left of my portion of the two lamb we bought in February. This is definitely the way to buy meat. For one thing, you meet your farmer, and that’s nice. I like having a connection to the person who raises the food for my table. I like supporting a local farm economy – maybe if we all try hard, not every inch of Massachusetts will be covered in suburban developments and condos. The price is right; I’m paying $5.50 a pound for organic pork, which is good. The animals are treated well, allowed to roam outdoors, and generally raised in a way that is sustainable and environmentally-friendly. Now, the pig we are buying is a Tamworth, which meant nothing to me a few days ago. But, through the wonders of Google, I now know that the Tamworth is a very old British breed, prized for good quality meat, especially bacon, and for the fact that they are amazing rooters. Apparently, they can be used to clear scrubby land. A study at Bristol University in the 1990s found them to be the best-tasting of all heritage or commercial pork varieties. But they don’t thrive indoors (which just goes to show that they are sensitive, intelligent creatures as well), so they aren’t normally raised commercially. Which isn’t surprising – when was the last time you had any pork that actually tasted like, well, pork? With any luck, I’ll have my digital camera up and running by the time we go to fetch the pig. The first farmer’s markets of the season open next week. The early-season options are: City Hall Plaza (Monday and Wednesdays), City Hall Plaza (Tuesdays and Fridays), Central Square (Mondays) and Davis Square (Wednesdays). I want to be excited, but I know that the first few weeks of the farmers markets are really just a matter of establishing a presence. I think they hope that after three or four weeks of seeing signs, people will remember that the market is open and actually go, just in time for some produce to arrive. Until then, we few overeager types will be trying to keep a good New England stiff upper lip while considering the choices – radishes, lettuce, rhubarb, and some quick breads. Inside, we will all be wishing we lived in California. I can’t believe it’s a blog. I’m not the first person you would expect to start blogging. For one thing, I generally shy away from public forums. My greatest fear in life is that I will accidentally witness a major news event and end up on television. But the internet is the public forum for introverts. No pictures! No identifying information! Blessed anonymity! And the chance to talk at length about things you find interesting long after you’ve bored your friends and significant other. I especially find local food interesting. Food raised by people, not corporations. Fresh food. Food that was grown close to where it's being eaten; food that brings an eater a sense of place. In my case, the place is Massachusetts. Over the last few years, I’ve been trying to eat more seasonally and locally. I started with shopping at farmer’s markets, then joined a farm share program, then got together with friends to buy meat in bulk directly from the farmer. I know there are a lot of other people who are doing the same thing. So this is what this blog is going to be about: what’s fresh at the markets and farms in the Boston area and how to cook with this week’s bounty. I will also try to pass along any interesting information I can get from the farmers about the growing season, the varieties of vegetables they grow, and all that fun stuff. This gives me an excuse to go to all the farmer’s markets I can and spend more than I can afford on stuff I don’t need. This is a good thing. I’ll also write about the cow-buying adventure, about trying to find organic pastured chickens and pork to buy directly from the farmers, and about anything else that seems relevant. Probably some things that aren’t relevant at all, too, because as far as I can tell, irrelevance is some sort of blogging convention.